YouTube introduced a handful of features aimed at giving video creators more control over the comments on their channels. 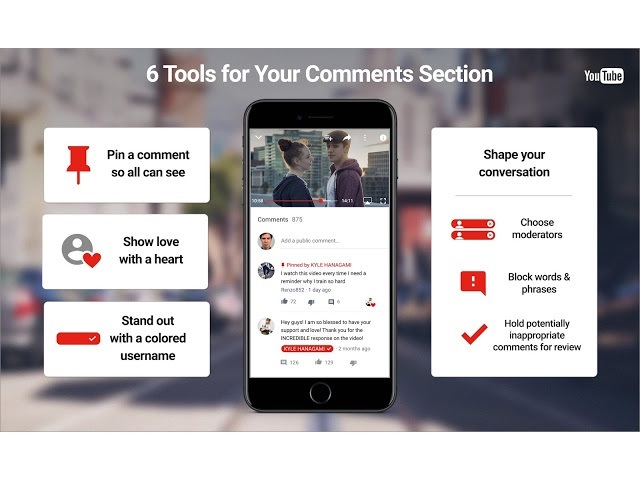 Pinned comments: Video creators can promote specific comments by pinning them to the top of their feeds, enabling them to highlight positive engagement or share information. Creator hearts: Video creators can now award hearts to their favorite comments. Creator user names: When video creators comment on their own channels, their user names will appear, surrounded by “a pop of color,” under the next of their comments. Verification checkmarks will appear next to the user names of verified creators. We’re introducing a new beta feature that allows you to hold potentially inappropriate comments for review. If you choose to opt in, comments identified by our algorithm will be held and you have the final decision whether to approve, hide or report these comments. We recognize that the algorithms will not always be accurate: The beta feature may hold some comments you deem fine for approval, or it may not catch comments you’d like to hold and remove. When you review comments, the system will take that feedback into account and get better at identifying the types of comments to hold for review. If you’d like to try this out, submit your channel information here. Readers: What do you think of the enhancements to YouTube’s comments section?